After an engagement becomes Facebook official, family members and friends of the newly betrothed couple participate in ring ogling that is so common, it seems like its own tradition. Rumor insists that diamonds are a girls’ best friend, but history has another tale to tell about its significance. When I was a little girl, I have a distinct memory of my father mentioning that you could tell a lot about a person by the presence of a ring on their finger. He told me that the ring symbolized commitment to another person, and that commitment could transcend to other pieces of that person’s life—a similar presentation of Jack Byrnes’ “Circle of Trust” in Meet the Parents. In Western society, many believe that the engagement ring is the utmost symbol of commitment to another, and although there are some links to ancient practices, rituals, and the rumored vein to the heart, the diamond ring did not become a symbol of marital promise in the United States until after the Great Depression (Ogletree, 2010). Once upon a time, betrothed women were protected by the Breach of Promise of Action (Brinig, 1990). This law entitled a woman whose fiancé had broken the engagement to sue him for damages, which included embarrassment, humiliation, and potential future marriage prospects—all important to women at the time since marriage was considered one of a woman’s only career opportunities (Brinig, 1990, p. 204). Most states repealed this law in 1935, which some scholars argue created a need for “a bonding device” within society, while others simply thought that the Depression created a need for tangible assets (Brinig, 1990, p. 209). It is difficult to know for certain considering that there are little-to-no records of engagement sales from this time period. 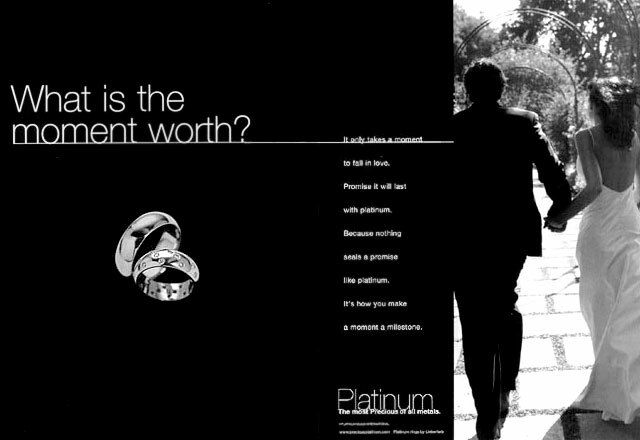 Four years later, De Beers, a diamond importing company, partnered with Ayers, a New York advertising agency, on a campaign that promised a “diamond is forever” (Brinig, 1990). Hollywood starlets were given diamonds to wear and movie scenes were scripted to include marriage proposals. The male engagement ring campaign failed to attract enough consumers to survive, however, masculine dominance was, and still is, present in the cultural engagement ritual. Historically, men prove their ability to care for and commit to their prospective wives through the purchase of an engagement ring--something considered "almost a rite of passage" for males (Howard, 2003, p. 843). An engagement is something that happened to a woman, while a man took action by initiating the proposal, signaling "male prerogative" (Howard, 2003, p. 843). After the Depression, a new marital trend started making its way around jewelers' windows: wedding bands for women and men. Before World War II, most marriages took place with only one wedding band--this is largely thought because Roman Catholics only required that the bride's ring be blessed (Howard, 2003). By 1937, etiquette books began to suggest that double-banded wedding ceremonies were more common, however, the trend did not solidify in America as a tradition until the late 1940s and early 1950s, when double ring marriages increased from 15 to 80% (Howard, 2003, p. 845). So why did male wedding bands catch on, but male engagement rings are an often unspoken aspect of marital history? Timing. During and after the war, marriage became a patriotic act: "The groom's ring became tradition when marriage, weddings, and masculine domesticity became synonymous with prosperity, capitalism, and national stability" (Howard, 2003, p. 846). Thus, jewelers could cater advertisements to men at war abroad, fighting to protect the families they left behind at home. 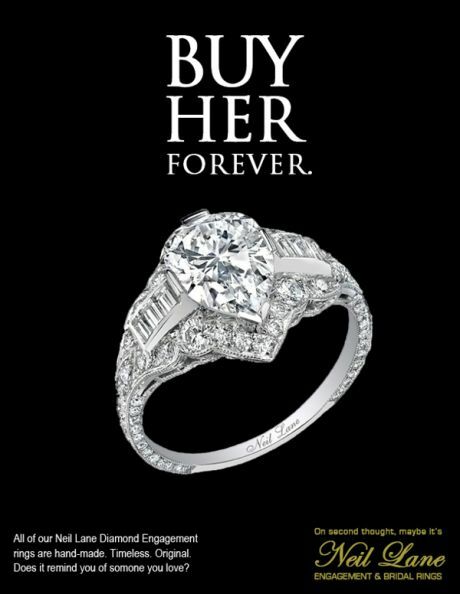 Today, engagement advertisements, although somewhat evolved, still reflect De Beers' original ideology that a diamond is forever, but when 40-50% of marriages result in divorce, I am left wondering what piece of forever today's couples are fighting to preserve (APA). 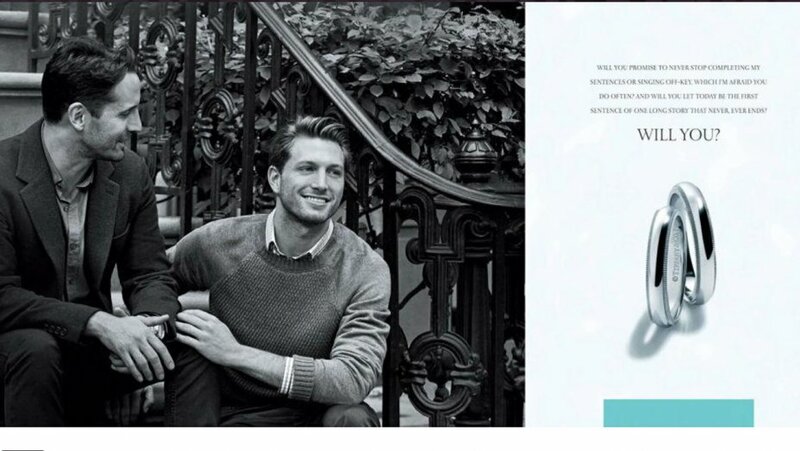 The Knot caters its data to wedding industry providers, as opposed to those exchanging vows. The report suggests that jewelers, photographers, caterers, and wedding planners should centralize their businesses based upon data trends in order to successfully market their services to modern couples. From a marketing perspective, this rationale makes sense. As a researcher, I am left wanting more. Historically, wedding traditions evolve and establish themselves over time. Some (the diamond ring and double wedding band) survive generations, while others (the male engagement ring) fade away into an unspoken history. It seems that most (but not all) couples embrace such traditions in a way that fulfills a marital obligation or expectation, rather than a choice. A marriage is as distinctive as the personalities of its partners. Couples not only have the prerogative to choose a style of ring, but also the power to forego tradition. A diamond ring may represent forever to America, but the success of a marriage is not dependent on the presence of a piece of jewelry. Questions for Readers: I want to hear from you! Did you know the history of engagement rings and wedding bands? Why did/do you want an engagement ring/wedding band? Why/why not? How do you feel about those who choose forego rings? Why? Have you received judgement for your engagement ring/wedding band choice (or lack thereof)? Brinig, M.F. (1990). Rings and promises. Journal of Law, Economics, and Organization, 6(1), 203-215. Howard, V. A “real man’s ring:” gender and the invention of tradition. Journal of Social History, 36(4), 837-856. Ogletree, S. M. (2010). With this ring, I thee wed: relating gender roles and love styles to attitudes towards engagement rings and weddings. Gender Issues 27, 67-77.